Our limited-time FREE Shipping on select Vision Engineering Visual Inspection System packages promo is focused on saving you money. Save the shipping costs on the state-of-the-art Mantis Compact, Elite, and Elite Cam systems from Vision Engineering. Eligible Vision Engineering Mantis Visual Inspection System packages include the: Vision Engineering Mantis Compact Series Stereo Microscope Visual Inspection System w/Bench Stand & 4X Magnification Lens, Vision Engineering Mantis Elite Series Stereo Microscope Visual Inspection System w/Universal Stand & 4X Magnification Lens, Vision Engineering Mantis Elite Series Stereo Microscope Visual Inspection System w/Bench Stand & 4X Magnification Lens, Vision Engineering Mantis Cam Elite Series Stereo Microscope Visual Inspection System w/Universal Stand & 4X Magnification Lens, and Vision Engineering Mantis Cam Elite Series Stereo Microscope Visual Inspection System w/Bench Stand & 4X Magnification Lens. These pre-configured systems offer everything you need to perform accurate visual inspection applications. Users of these ergonomic, eyepieceless microscopes report increased comfort and productivity. 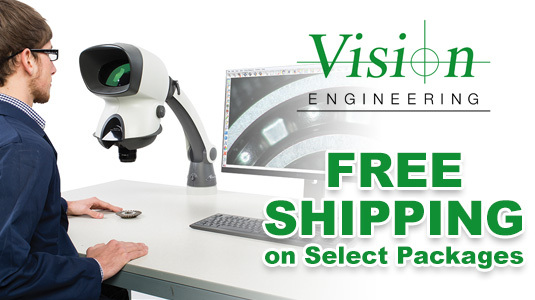 Visit our Vision Engineering Inspection Systems Free Shipping promo page to make your purchase today. For orders, or more information, you may also contact us by phone (800-966-6020), email, or via our Web site. QSource.com also offers a complete selection of other Vision Engineering products.